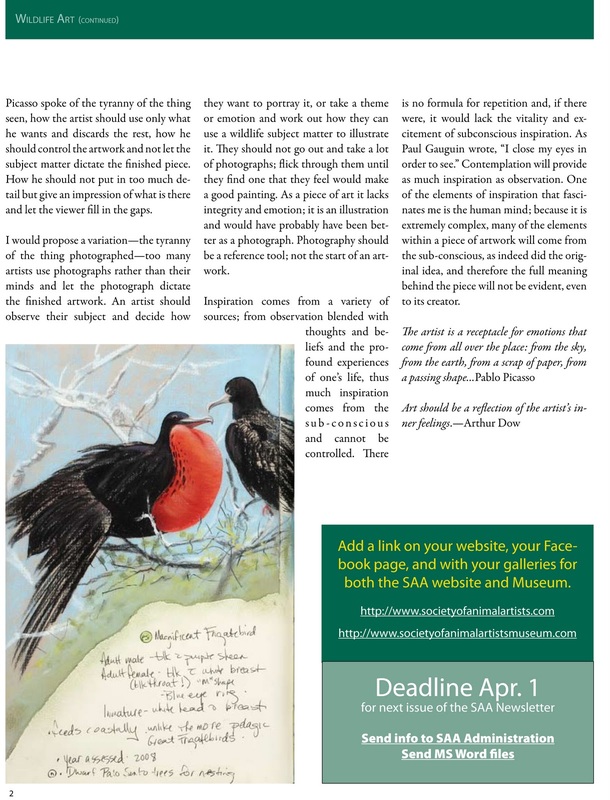 Wildlife Art Journal is again accepting images from painters, sculptors and photographers to appear in its next "Gallery of the Commons" the end of January. 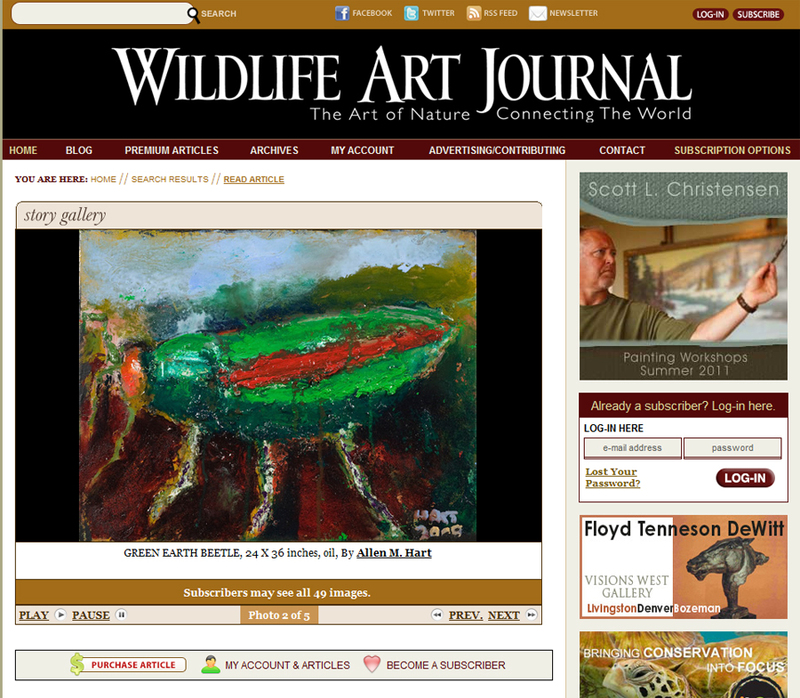 What does WAJ mean by "wildlife art"? Any artistic portrayal of wildlife in a natural or urban environment, in any style. We do not hold to a narrow definition. See Simon Gudgeon's definition in the latest SAA newsletter. 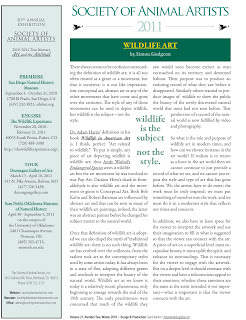 If you are interested, please send a jpg image of your work, along with title, dimensions, and medium to: editor@wildlifeartjournal.com It's a great way for other artists and collectors to see your work. Please also include your web address. We'll provide a hotlink back to your site. The Winter 2011 edition of the Society of Animal Artists newsletter is out, this is one of the articles in the edition. Wildlife is the subject – not the style. There always seems to be confusion surrounding the definition of wildlife art; it is all too often treated as a genre or a movement, but that is incorrect; it is not like impressionism, conceptual art, abstract art or any of the other movements that have come and gone over the centuries. The style of any of those movements can be used to depict wildlife, but wildlife is the subject—not the style. Dr. Adam Harris’ definition in his book Wildlife in American Art is, I think, perfect: “Art related to wildlife.” To put it simply, any piece of art depicting wildlife is wildlife art; thus Andy Warhol’s Endangered Species series is wildlife art but the art movement he was involved in was Pop Art. Damien Hirst’s shark in formaldehyde is also wildlife art and the movement or genre is Conceptual Art. Both Bob Kuhn and Robert Bateman are influenced by abstract art and that can be seen in many of their wildlife art paintings, indeed, the latter was an abstract painter before he changed his subject matter to the natural world. Once that definition of wildlife art is adopted we can also dispel the myth of ‘traditional wildlife art; there is no such thing. Wildlife art has evolved over the millennia, from the earliest rock art to the contemporary styles used by some artists today. It has always been in a state of flux, adopting different genres and methods to interpret the beauty of the natural world. Wildlife art as we know it today is a relatively recent phenomena, only beginning to emerge towards the end of the 19th century. The early practitioners were concerned that much of the wildlife they saw would soon become extinct as man encroached on its territory and destroyed habitat. Their purpose was to produce an enduring record of what they saw before it disappeared. Similarly others wanted to produce images of wildlife to show the public the beauty of the newly discovered natural world that most had not seen before. That production of a record of the natural world is now fulfilled by video and photography. So what is the role and purpose of wildlife art in modern times, and how can we elevate its status in the art world? If realism is to return as a force in the art world then we cannot continue to just provide a record of what we see, and we cannot just repeat the style and type of art that has gone before. We, the artists, have to do more; the work must be truly inspired; we must put something of ourselves into the work, and we must do it in a modernist style that reflects our times and concerns. In addition, we also have to leave space for the viewer to interpret the artwork and use their imagination to fill in what is suggested so that the viewer can connect with the art. A piece of art on a superficial level must encapsulate beauty, it must uplift the spirit, and enhance its surroundings. That is necessary for the viewer to engage with the artwork. But on a deeper level it should resonate with the viewer and have a subconscious appeal to their emotions, whether those emotions are the same as the artist intended is not important—what is important is that the viewer connects with the art. Picasso spoke of the tyranny of the thing seen, how the artist should use only what he wants and discards the rest, how he should control the artwork and not let the subject matter dictate the finished piece. How he should not put in too much detail but give an impression of what is there and let the viewer fill in the gaps. I would propose a variation—the tyranny of the thing photographed—too many artists use photographs rather than their minds and let the photograph dictate the finished artwork. 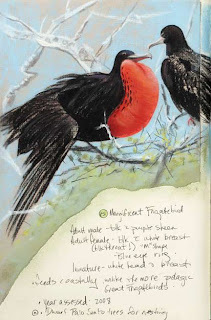 An artist should observe their subject and decide how they want to portray it, or take a theme or emotion and work out how they can use a wildlife subject matter to illustrate it. They should not go out and take a lot of photographs; flick through them until they find one that they feel would make a good painting. As a piece of art it lacks integrity and emotion; it is an illustration and would have probably have been better as a photograph. Photography should be a reference tool; not the start of an artwork. Inspiration comes from a variety of sources; from observation blended with thoughts and beliefs and the profound experiences of one’s life, thus much inspiration comes from the s u b - c o n s c i o u s and cannot be controlled. There is no formula for repetition and, if there were, it would lack the vitality and excitement of subconscious inspiration. As Paul Gauguin wrote, “I close my eyes in order to see.” Contemplation will provide as much inspiration as observation. One of the elements of inspiration that fascinates me is the human mind; because it is extremely complex, many of the elements within a piece of artwork will come from the sub-conscious, as indeed did the original idea, and therefore the full meaning behind the piece will not be evident, even to its creator. -from the Society of Animal Artists 2011 newsletter, see the entire newsletter online by clicking here.